You'll have a lot of fun making this truly unique neck piece. Made from a cord-like yarn and using a really fun stitch you'll have this knit quickly and it's so lightweight you can wear it right now. The yarn is called Summer Tweed – takes just 1 ball and size 9 and 11 needles (straight or circular). 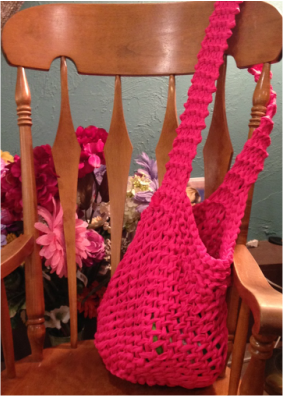 Need a practical big bag for the beach towels or a big project bag? 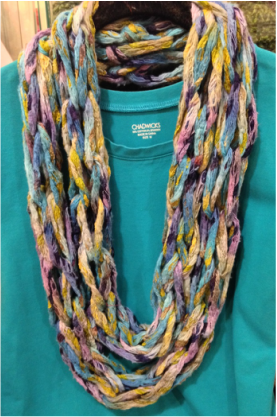 We've made this quick-knit one out of t-shirt knit on a spool. “Noodles” will make a smaller bag and “Craft-tee” will make the big bag like our sample. You'll need a size 13 & 17 – 24” needle for the small bag and a 15 & 19 – 24” needles for the big bag. You'll learn picking up stitches and knitting in the round plus the 3-needle bind off. Start it Thurs. and wear it Sat. night. 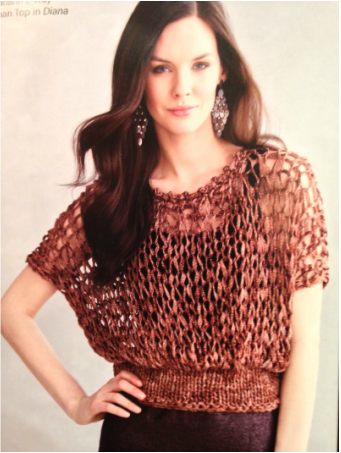 Really you could with this quick but elegant knit piece. It's made from a slinky metallic ribbon on a size 17 needle and made all in one piece. Just a little seaming on the sides. 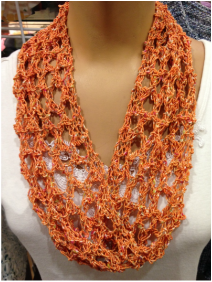 We'll start it on Thursday the 14th and then come back on Friday the 15th to do the neckline. You should then be able to finish the garment to wear out on a date Saturday night (or whenever). Jump on board and ride the latest knitting trend – “Arm Knitting” Let your arm be the needle as you make this quick & breezy eternity scarf. Several different Spring yarns to choose from and no knitting needles required.